A luxurious and elegant hotel built in 1854 on the city's ancient fortifications. Completely renovated and modernized, it offers its guests an extensive range of services to render their stay most enjoyable and rememberable. Located in the heart of the city's business and shopping district with a splendid view over Lake Geneva. The only luxury hotel on Lake Geneva's left bank. The hotel is ideally situated in the heart of the business and commercial district. It overlooks the lake and its famous fountain the "Jet d'eau" and is just a short stroll from the English Garden and the shores of the lake... Geneva Hotels have been divided in 3 main categories : Luxury Hotels, Charming Hotels, Cheap Hotels, Of course the price and the level of service and comfort depend on the category - If you want to see all hotels listed please select your prefered hotels category and see our exclusive hotels rates - We wish you a pleasant stay in Geneva. 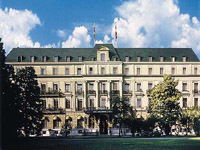 This Site is dedicated to Geneva and its accomodations - This site also provide informations about the city itself and the tours opportunities departing from Geneva - The Metropole Swissotel in Geneva is one of the properties selected - Room rates have been negociated and should be very competitive. We hope that this Geneva Luxury Hotel Website will help you in planning your trip - Thank you for visiting Metropole Swissotel hotel website page : Booking and online reviews.